Check out our expert selection of 2 post lifts. Choose from a wide variety of two post lifts from the nation's leading manufacturers: BendPak, Dannmar, and Challenger Lift. For even greater savings, check out our Monthly Specials for great deals! 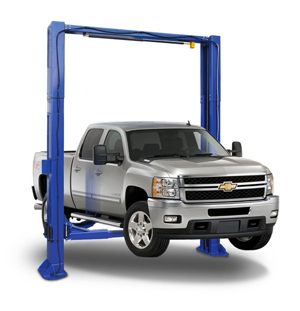 We also offer our value priced line of 2 post auto lifts exclusively from Auto Lift. Our two post lifts range in lifting capacity from 8,000 - 18,000 lbs.and come with our stamp of approval. Check out our In-Depth Lift Comparison, Two Post Car Lift Buying Guide and learn about Car Lift Safety Features. Adjustable Overall Height: 137-½" to 142-½"
Max Lift Height (w/o Adapters): 68-½"
New single piece column asymmetric two post auto lift manufactured by Autolift. 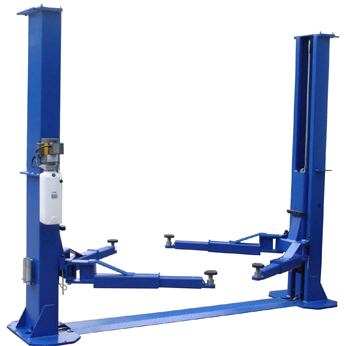 New single piece column symmetric two post auto lift manufactured by Autolift. This portable two post lift is perfect for low-clearance ceilings and home garages. Limited Time Offer Sale Price Valid While Supplies Last! Engineered and built to offer great features at an economical price, the AL2-11KC-DX features and designs will make this the most used lift in your garage. overall Width w/Power Unit: 145-1/2"
Limited Time Offer Free 3 year Warranty, Liftgate, & Residential Delivery Valid While Supplies last! 10,000 lbs. ALI Certified heavy duty two post lift is a premium Bi-Symmetric design clear floor vehicle lift. overall Width w/Power Unit: 145 1/2"
Max Lifting Height w/Tallest Adapter: 76-1/2"
Dannmar D-8 Two Post Car Lift 8,000 lb. This vehicle lift is extra-wide for those larger vehicles, and its extended arm reach will cover most vehicle lifting points. The D-8 has a low-profile design which is perfect for shops and garages with height restrictions. Overall Width (Outside of Columns): 137"
Max Lifting Height (Pad Only): 76"
Limited Time Offer Sale Price & Free Extended 3 year Warranty Valid While Supplies Last! Formerly know as Brigadier 10/ACX & D-10ACX. The Brigadier 10ACX is the wider version of the 10AC, made specifically for wider vehicles and a higher drive thru clearance. Overall Width (Outside of Base Plates): 143.5"
Max Lifting Height (Pad Only): 73"
Formerly know as D-10CX & Brigadier 10CX. 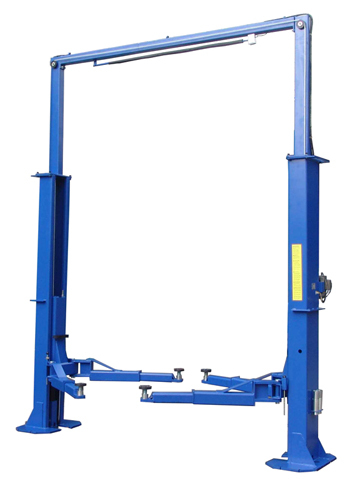 This vehicle lift is designed to be the workhorse of any automotive repair business. Overall Width (Outside of Base Plates): 145"
The GrandPrix™ is a 7,000-lb. capacity two-post car lift unlike any other. Boasting narrow profile columns that don’t consume valuable floor space, as well as a single hydraulic cylinder that offers an incredible 2:1 lift, the GrandPrix provides more power and speed than any ALI-Certified two-post lift in its class. Remarkably, the patent-pending design is the only clear floor two-post lift available that fits in compact garages with ceilings as low as 9 feet. The Grand Prix’s space-saving design means you don’t need to renovate your garage to make room. It’s a clear floor 2-post lift that’s ready-made to fit in virtually any garage. 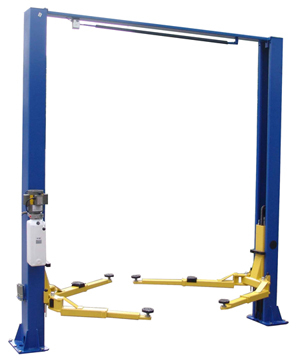 A quality direct drive two post automotive lift by Auto Lift. Challenger Lifts' SA10 features the ability to be configured in either the symmetric or asymmetric position dependent upon the service requirements of your shop. Overall Height (Cylinder Extended): 142.5"
This super-industrial-strength piece of equipment has got it all: cutting-edge technology, top of the line materials, design that's ahead of its time and a 10,000 pound lifting capacity. Fits in shops with ceilings higher than 12', and it won't crowd your floor while you work beneath a vehicle. 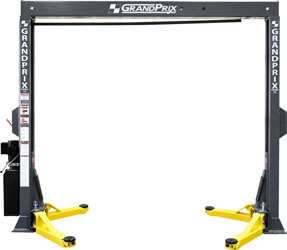 Max Lifting Height (Pad Only): 73" - 75"
The BendPak XPR-10AS offers exceptional direct-drive lifting performance with an important added benefit. We rotated both posts inward to give you the ability to open a vehicle's doors while it's still raised, all without sacrificing drive-thru clearance. This super-industrial-strength piece of equipment has got it all: cutting-edge technology, top of the line materials, design that's ahead of its time and a 10,000 pound lifting capacity. Fits in shops with ceilings higher than 12', and it won't crowd your floor while you work beneath a vehicle. 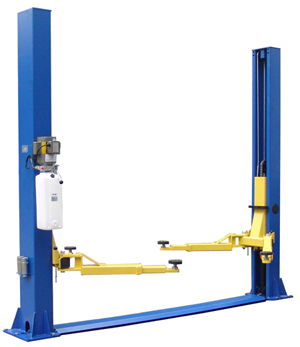 The XPR-9S Two-Post Auto Lift solution offers automotive service professionals unparalleled lifting performance and lasting quality. State-of-the-art technology, top-notch materials, a forward-looking design and a 9,000-pound lifting capacity make this lift a fantastic value that will endure years of hard labor with ease. New A Texas style two post floor plate lift with 12,000 lb. lifting capacity, large twin 3” cylinders with low friction chain rollers, and a “big foot” base plate for extra stability. 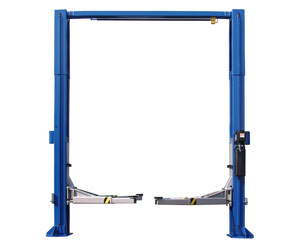 Overall Width w/Power Unit: 147.8"
The E10 two post lift features Challenger's innovative Versymmetric™ Technology, providing technicians the versatility to lift vehicles both symmetrically and asymmetrically within the same service bay. Rise Height (w/Pad): 79 1/8"
The safe and rugged XPR-10S-168 two-post lift features extended height columns for added overhead clearance and an adjustable top beam to accommodate wide or narrow installation set-ups. The adjustable width design allows you to choose the best setting for your specific space or vehicle lifting requirements. The powerful and secure XPR-10AS-168 is an incredibly rapid two‐post lift with a robust menu of features to increase efficiency and productivity. Extended height columns provide added overhead clearance and an adjustable width design allows you to choose the best setting for your specific space or vehicle lifting requirements. This true asymmetric lift features 30° rotated columns for added door-opening clearance and interior car access. The exclusive Tru-Metric carriage and arm design combines to give users the ability to load vehicles either symmetrically (centerline of vehicle at column) or asymmetrically (centerline of vehicle behind column). 12,000 lbs. ALI Certified heavy duty two post lift is a premium symmetric design clear floor vehicle lift. overall Width w/Power Unit: 151"
Max Lifting Height w/Tallest Adapter: 79-1/4"
New Updated Features. A Texas style two post lift with 15,000 lb. lifting capacity, large twin 3” cylinders with low friction chain rollers, and a “big foot” base plate for extra stability. Hofmann 10k 2-Post Combo automotive/general purpose lifts are packed with premium features: industrial-strength columns, low-friction lift carriage slides, low-wear components with plated arm pins, steel pulleys and more. Overall Height Adj: 147.5" / 137.5"
Rise Height (w/Screw Pads): 77.75"
Because taller mechanics are sometimes at a disadvantage while they work, we’re making it easier to wrench under a fully raised vehicle. The XPR-10AXLS model adds 6” of lift and extends the overall height by 6”. This may seem like a small change, but taller people know that the difference between stooping and standing under a two-post lift can be the difference between severe back/neck pain and working in total comfort. For work safety, always look for Lift Certifications. Wondering how you're going to receive your new 2 post lift from Best Buy Auto Equipment? View our shipping frequently asked questions. Chances are one of our other customers has asked the same questions and already has their new two post auto lift.